I enjoyed this shampoo and conditioner set a lot. I had quite a bit of hair loss from stress, and these products made my hair feel and look thicker after the first use. I've used it for a couple months and new growth is appearing. 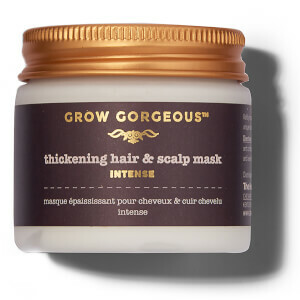 Not sure if new growth is due to these products, but they sure made me feel better about my hair in the meantime. 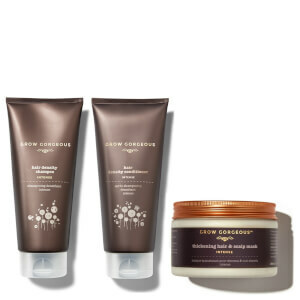 I just knocked one star off because the shampoo is just a tiny bit drying for my long hair, but I ordered the repair conditioner from the Grow Gorgeous line to put on my ends, and problem solved. Products seem strongly fragranced which didn't bother me, but might be contraindicated for some. Have already repurchased and will continue to do so. My overly bleached and thin hair has gotten noticeably fuller and is in a fairly good condition when used in conjunction with the leave-in conditioner, however, my scalp has gotten a bit drier than usual.